Disc replacement surgery is a type of procedure used to remove a damaged disc in the spine and replace it with an artificial one. This type of artificial disc replacement helps the spine to maintain its stability and flexibility in a way that traditional disc removal surgery cannot match, largely due to the metal rods and screws used during traditional surgery to support the spine after a disc is removed. Patients in Carson City, Nevada now have access to disc replacement surgery thanks to Tahoe Fracture & Orthopedic Medical Clinic. 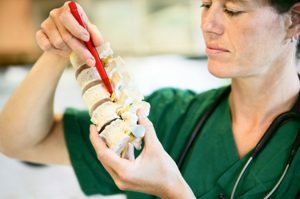 Before disc replacement surgery is recommended, patients are often required to go through a series of conservative treatments designed to relieve the symptoms of a damaged disc without surgical intervention. These non-surgical treatments often include physical therapy, stretching, pain medication, and hot/cold compresses, as well as other personalized therapies. Only after these treatments have proven ineffective over a course of several months will surgery be recommended. During disc replacement surgery, an incision is made in the neck or back to access the spine. Once the spine is reached, the surgeon will remove the damaged disc. This can ease pressure on a nearby pinched nerve, which should help your symptoms of pain and limited mobility to subside. After the damaged disc is removed, there will be a gap between the two surrounding vertebrae. An artificial disc will then be inserted into this gap in order to maintain the proper support and mobility within that section of the spine. For many patients, physical therapy will be recommended after surgery to help restore the proper range of motion to the spine. At our clinics in Carson City, our physical therapists have helped many patients recover from spine surgery by prescribing a routine of personalized stretches and low-impact exercises, as well as other therapies. To learn more about the disc replacement surgery offered at Tahoe Fracture & Orthopedic Medical Clinic in Carson City, NV, contact us today. We can schedule an appointment to review your symptoms, run tests if necessary, and determine if surgery is your best treatment option.